Today, while eating my Ramen Noodles Instant Lunch, I realized something. I realized that what and how we eat really represents how we live. Sure I have a home cooked meal a few times a week, but how many of my meals are instant? How many corners am I cutting when it comes to how I eat? Whether the dinner was frozen or from a fast food restaurant or from a package that says “just add water,” it is clear that my hurried nature and apathetic attitude has caused me to cut out the important things in life, thereby living a life without substance. 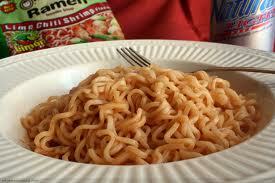 I am living a Ramen Noodle lifestyle. The funny thing about that is most people living in the city or suburbs are probably doing the same thing. We are always in such a hurry to get to some goal or rushing to reach the end that we neglect the essentials. And it’s not just with food. In fact, food is probably the least of our problems. Our friendships, time with our children, reading a book, etc are just a few things that suffer when we live our Ramen Noodle lifestyles. If we watch a movie with our kids, then that qualifies as “quality time.” But really, in those 2 hours what did your child really learn about you, and what did you learn about them? Have you really grown any closer? Probably not. But popping in a DVD and sitting on your couch is the Ramen Noodle solution to making your kid happy. It fills them up for the time being, but what have they really benefited? What have you? Now don’t get me wrong. I am not trying to rip on busy parents. In fact, I really think watching a movie from time to time is a good time, and fun for children too. And it was just an example. But we do this with everything. For example. We hear about a good book. So, we say we want to read it, but we just can’t seem to find the time. So, we go out and buy an audio version and stick it into our cd players in the car on the way to work. After a week or so, the cd is done and we say we have read this “good book.” But have we really read it? Sure, we can recall some details and the ending and maybe even the vague themes the book presents, but have we really read it? In a month or so, do we remember those details? Did the book touch us the same way it would have if we had actually read it? Did we learn anything from hearing the words read to us by an actor as opposed to reading it in our own voice? Did we catch the subtle nuances of the book while we were switching lanes, having road rage, and worrying about getting to work on time? So, yes we can say we have read this fantastic book, but did we really get its substance? I doubt it. Excercise. Everyone says they would like to work out more. We have a million excuses for why we haven’t yet, but we all want to do it. Running/jogging is a great way to stay in shape. Running a few miles around your neighborhood or through the park is not only healthy for the body, but great for the spirit. No one can tell you it’s not invigorating. Oh but wait, we don’t have time for that either. So instead, we’ll buy ourselves a few hundred dollars worth of equipment to simulate running. So we put our treadmills in our basements, and we run miles without actually going anywhere. We don’t have the wind blowing through our hair, we don’t see other people, and we don’t get any sun. Granted, we lose the calories, and we shape up, but did we really get the full experience of excercise? Do we release as many endorphins? And there are so many examples of how we do this in our daily lives, but I think I’ve gotten my point across. We sacrifice so much because of time. We never seem to have any time for anything, especially the things that are worth having time for. We are all guilty of this. But maybe if we stopped to smell the roses every once in a while, we may find that life is truly worth living. And living it to its fullest.